Water Relations of Foods consists of proceedings of an international symposium on “Water Relations of Foods” held in Glasgow, in September 1974. Organized into seven sections, the book presents the various papers delivered in the symposium. It describes the physical chemistry of water in simple systems as well as in the more complex food component systems (carbohydrates, lipids, and proteins), with emphasis on the nature of the intermolecular forces involved. It also reports the various techniques used to measure the state of water in food and in model systems made up of food components. 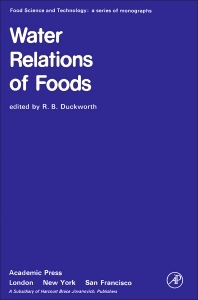 Furthermore, the book discusses water activity and the growth of food spoilage and pathogenic organism; water relations of enzymic and non-enzymic deteriorative reactions in food; effects of freezing and thawing of water in food systems; and the significant aspects of food quality as affected by water in the system. Lastly, the modification of the state of water in foods is addressed. This publication will indeed help advance the understanding on this field of interest.